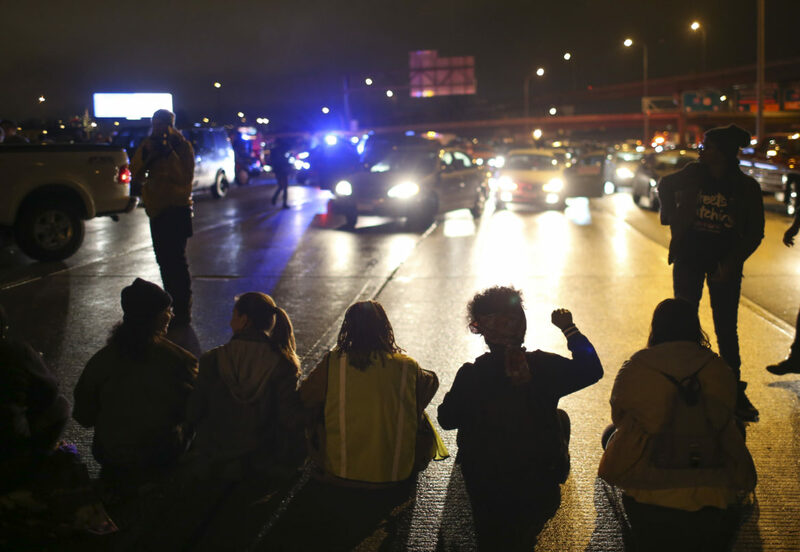 After a man was shot by Minneapolis police early on November 15, 2015, Black Lives Matters and others protested by marching from the Minneapolis Police 4th Precinct station to I-94, shutting down westbound traffic on the freeway on the evening of November 16. Update Aug. 22, 2016: A Minnesota judge ruled Monday against placing on the November ballot an amendment that would have required Minneapolis police officers to carry their own liability insurance to make payouts in misconduct settlements. Hennepin County Judge Susan Robiner dismissed the lawsuit brought by supporters to get the amendment on the ballot, ruling that it preempted and conflicted with state law. In an earlier 10-3 vote, the Minneapolis City Council had rejected the plan. What could be the first-of-its-kind voter initiative to require police to pay in misconduct settlements is heading to court after the Minneapolis City Council declined to place the amendment on the November ballot. The City Council recently rejected the initiative, which has gained momentum since the high-profile police shootings of Philando Castile and Jamar Clark in the Twin Cities region. The city claims the proposed charter amendment clashes with state law; supporters of the measure are asking a state court judge to force the city to place the item on the ballot. The amendment would require police officers to carry professional liability insurance — similar to the malpractice coverage carried by doctors and lawyers. Currently, taxpayers pick up the tab for settlements in civilian lawsuits against police officers. The pursuit of the idea is uncharted territory for any U.S. city – and for police accountability activists. The charter amendment demonstrates a new willingness to experiment with alternative methods of reform at a time when repeated police shootings of black men are highlighting the volatile relationship between law enforcement and communities of color. The liberal Twin Cities joined a seemingly unending national discussion following the police shootings of Clark and Castile. Last month, in suburban Falcon Heights, police officer Jeronimo Yanez shot and killed 32-year-old Castile during a traffic stop. His girlfriend recorded and reported live on Facebook the horrific aftermath. And in May, the Hennepin County attorney declined to charge two officers in the fatal shooting of 24-year-old Clark, who was killed in his North Minneapolis neighborhood in November. The incident led the next day to an 18-day encampment outside the officers’ station house and boosted interest in the police insurance petition, which was just then gathering signatures. What is most striking about this idea, one local expert says, is not whether it makes it onto the ballot but how it indicates a lack of trust in the status quo on the part of many Minneapolis residents. As a lead proponent of the amendment, Michelle Gross told The Chicago Reporter in June , “It’s using market forces to motivate individual cops to change police culture.” That is different, she noted, from relying on city hall or the police department. The police insurance amendment transfers some liability from the city onto an individual officer and his insurance provider, making an officer financially culpable if he or she has too many complaints. (The initiative does not spell out how many complaints.) While significant questions remain, not least around implementation, they were not what the City Council was considering in its decision. Though the petition surpassed the threshold for verified signatures with more than 6,869, city officials said the amendment did not have legal standing to be placed on the ballot. In her brief to the council, City Attorney Susan Segal determined that the amendment both preempted and conflicted with existing state indemnification and employment law. Council Member Andrew Johnson, one of three members who supported the initiative, disagreed in a blog post. Johnson, an engineer by profession, points out that most city council members are not lawyers. Cano sees a missed opportunity to advance a critical local dialogue around police accountability that Minneapolis residents increasingly want. “It’s generally understood that cities, especially municipalities, can have the most impact on reforming local police culture and systems—much more than the state and federal government,” she said. Supporters of the police insurance amendment have until Aug. 26 to get the initiative on the November ballot. Whether or not a judge allows the proposed amendment to appear on the ballot, local activists say that momentum is building to demand change. “People are beginning to see that this is a much deeper problem than just a few renegade officers,” said Tony Williams, an organizer with Neighborhoods Organizing for Change, which along with the NAACP and Black Lives Matter led community protests around the shootings of Clark and Castile. “People are done with the status quo,” he said. ”They want to find creative, alternative solutions. The liberals chickens have come home to roost. “I have a female cat who displays dominance over the entire household and she gets away with it. What can I do? You sure got the name right. At least you’ll be used to it in the next administration. Thank you so much for an outstanding article on our Police Insurance Amendment. After fighting with the city council and police administration for years in a largely futile effort to extract even the most modest accountability measures, the community is bypassing them and putting our own accountability measures in place. I look forward to a good ruling from the judge and a vote by members of our community on our Police Insurance Amendment.